There are frequent complaints that U.S. income inequality has increased in recent decades. Estimates of rising inequality that are widely cited in the media are often based on federal income tax return data. Those data appear to show that the share of U.S. income going to the top 1 percent (those people with the highest incomes) has increased substantially since the 1970s. However, there have been large changes in U.S. tax rules over time that have made a dramatic difference on what is reported as income on individual tax returns. Tax changes induced thousands of businesses to switch from filing under the corporate tax system to filing under the individual tax system. Corporate executives switched from accepting stock options taxed as capital gains to nonqualified stock options taxed as salaries. The huge growth in tax-favored savings plans, such as 401(k)s, has resulted in billions of dollars of investment income disappearing from tax returns. Meanwhile, studies of inequality that are based on tax return data usually exclude transfer payments, which results in exaggerating the shares of income received by those at the top by ignoring growing amounts of income at the bottom. Measurements of inequality have also been affected by large reductions in income tax rates, particularly in 1986. Estimates by many economists indicate that the reported income of highincome taxpayers is very responsive to tax rates. When top tax rates on wages or capital gains fall, reported incomes rise, and a larger fraction of the incomes of those at the top show up on tax returns. International comparisons show that reported income shares of those at the top have risen the most where top tax rates have been cut the most (the United States, the United Kingdom, and India) and have risen the least where top tax rates have remained very high (France and Japan). In sum, studies based on tax return data provide highly misleading comparisons of changes to the U.S. income distribution because of dramatic changes in tax rules and tax reporting in recent decades. Aside from stock option windfalls during the late-1990s stock-market boom, there is little evidence of a significant or sustained increase in the inequality of U.S. incomes, wages, consumption, or wealth over the past 20 years. 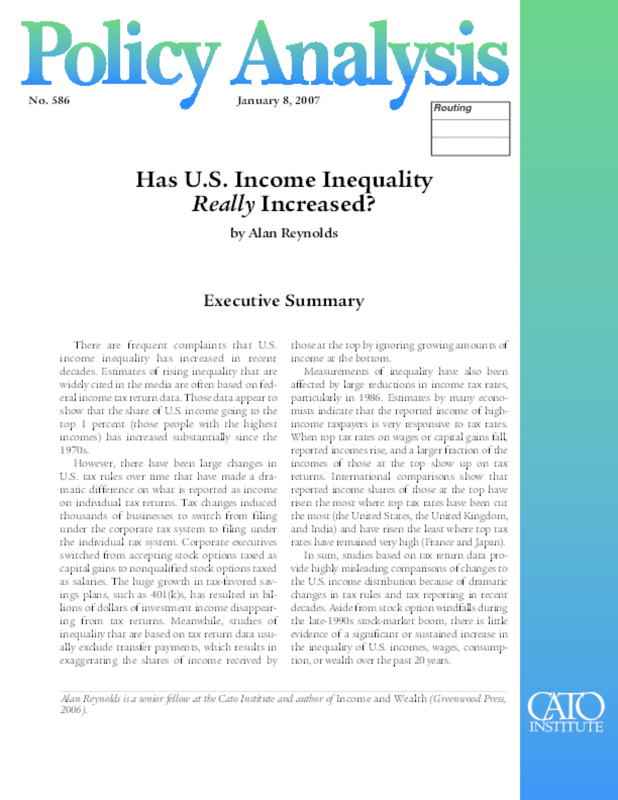 Title: Has U.S. Income Inequality Really Increased?